After the massive South Asian earthquake last year, Dr Irfan Noor kept a diary for the BBC News website from Pakistan's North West Frontier Province where he was working as part of a medical relief team. He is now in Pakistan-administered Kashmir and says that the challenges are immense for a district which still looks like a disaster area. 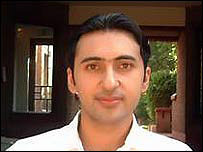 When the earthquake struck I was in a hospital in Abbottabad. Ceilings caved in and the building was seriously damaged. It was terrifying. But within days, I was out in the remotest districts of the North West Frontier Province. I was shocked and appalled when I saw the devastation in these areas. The terrain was very difficult. All health facilities had been destroyed. The roads were blocked and so many people were stuck in the villages cut off by landslides, so many died. We worked amidst strong winds, rain and sometimes hail. It really was a nightmare and I will never forget what I saw. A year later and I am now working in Kashmir. One of the things that frightens you when you first get to the valleys outside Muzaffarabad is that the shape of the mountains have really changed. It was as if the mountains were washed away. 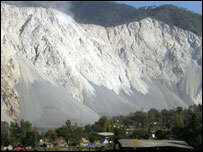 It was an absolutely massive landslide and the landscape has been scarred. Parts of the district still look like a disaster zone. 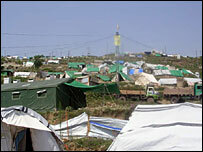 People are living in refugee camps around the city. Many houses are still rubble. A number of aid organisations have pulled back and these people are still living in camps with serious water and sanitation problems. It could be that we are about to face another public emergency. The population is clearly still in need. Many people have told me that their tents are getting old and need to be replaced. I am working for the medical charity Merlin and our biggest concern is respiratory infections and diarrhoea. In the remote Neelum valley, scattered villages are vulnerable to the elements. 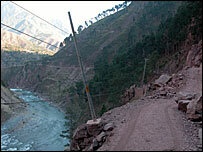 Roads frequently get blocked by landslides and villages could get cut off as the winter sets in. For us the big concern is that winter will continue until March or April. We are prepared to work until then. The earthquake had a severe psychological impact on the people here. Morbid depression is common. I met a 60-year-old man in Balakot who had attempted suicide. He told me his wife, son and grandchildren had died. Only he was left alive and he had no idea what to do. He felt he had no purpose in life. Even after a month, people were coming in with injuries. There were no roads it took so long to get there. One man told me how he carried his mother on his shoulders for three days without food, water or shelter until he reached a road. These stories still haunt me too. I feel as if I've devoted a lot of the last year to the earthquake. But I fear that people's physical and psychological condition will worsen if another winter passes without great improvements. So we are still scared for them. I was amazed by the generosity of the people of Pakistan. I have seen some reconstruction and rebuilding by the government and some of the agencies. People have been given money to make their homes but not everyone got their share. Much of Muzaffarabad city has been quite well rebuilt and life is going on as normal. In the Neelum valley those who can are building their homes out of wood and other materials. But this feels like an unfinished place, it feels like somewhere that still needs help.